A mountain barbet inhabiting the permanently misty, high-altitude "cloud forests" of the Andes, this species has a long-bodied look. It often hops along branches in a forward-leaning attitude, raising its tail for balance as it turns quickly. Single birds or pairs join mixed-species flocks that feed at all levels in the forest. Toucan Barbets feed mainly on fruit, also taking insects, other invertebrates, and small creatures such as lizards. The call is a loud honk, and pairs often perform duets. • NBST An unlined cavity in a tree hole. Inconspicuously colored except for the reddish tuft on its forehead, this is a bird of mountain forest. 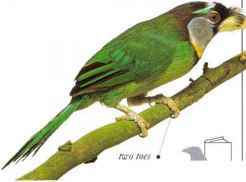 Usually occurring in small parties in tall trees, it clambers about among vines and foliage, looking more like a parrot (seepp. 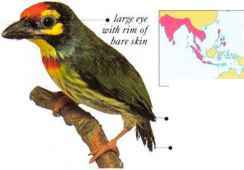 169-185) than a typical barbet. It feeds greedily on small fruits, at times staining its plumage. Birds are quiet but keep in contact by uttering soft whistles and buzzing notes like the noise of a cicada. • NEST Unknown; probably a cavity in a tree.